I realize this may be hard to believe because of what day it is(April 1st), but according to the person who leaked/spread this rumor it is not an April Fool’s Joke. I’ll believe it when Microsoft makes an official statement, but for the sake of reporting, I’m here to give you the run down. The rumor floating around now is that Project Scorpio will be revealed some time next week, which starts in a little less than two hours for me. The leaker goes on to say that the system may have bluetooth support, the dev kit has an LCD panel on the front of it that lets developer see stats in real time, and said front panel also has a nifty animation. 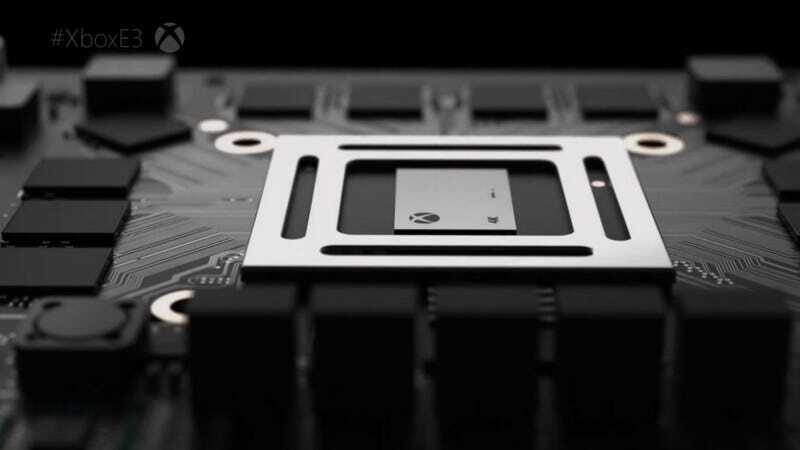 In addition to that he confirmed that Scorpio will in fact have the promised 6 TFLOPs of computing power as well as the other specs that Microsoft promised, but they did not exceed those specs. So as it stands, Scorpio has the aforementioned 6 TFLOPs, 8 CPU cores, and 320GB/s of memory bandwidth. Since that was so short, I’m just gonna tack on the rumor from a few months ago where Digital Foundry claimed to have seen a white paper on the Scorpio. In it, the Scorpio was stated to have 4.5x the computing power of XB1 and 4x the L2 cache, and it will support delta color compression. So that should give you a decent idea what the Scorpio can do. I remember there also being a rumor that it had 12GB of RAM with 8GB for games, but I can’t recall or find the source for that so take that with an even bigger grain of salt, probably the whole shaker, than the rest of it. If the rumor is true then Microsoft will likely announce the reveal event within the next few days. If not, then the week will come and go as always, but it’s guaranteed that if we don’t get a dedicated event before E3, then it is guaranteed to get its full reveal at E3. However, Phil Spencer talked to IGN’s Podcast Unlocked crew a few weeks ago and stated that their stage at E3 may be too crowded with Scorpio and all its technical details up there so they were definitely considering a dedicated event for those interested in the hardware itself and save E3 for the games. In addition to a Thursday reveal, it was also specified that the specs would come out of Eurogamer/Digital Foundry, who at this point have a habit of leaking console specs. Update #2: According to Windows Central, the current dev kits for Project Scorpio are running at approximately 80% of the systems potential, with an optimization update scheduled for May to bring it up to 90%, and a second June update aimed at bringing it up to 100%. This should be taken with a few grains of salt due to the fact that nothing is cited in their article, instead claiming they received the information. If the information from Windows Central is accurate, it contradicts previous rumors that Microsoft had in fact hit their targets already and be delivering the product they promised this holiday season. The article implies that as of right now Microsoft is actually behind on their targets and the optimizations are intended to correct that prior to launch. The May optimization update appears to be locked in, but the June one is not set in stone. Regardless of when they hit their targets however, if they do manage to get the Scorpio to give every last ounce of its potential power to developers on day one, there is nowhere to go, but up from there as Microsoft makes further optimizations and developers gain experience with the system and make optimizations of their own to get even more out of it.